You have decided that you need to hire a fly fishing guide want to try your hand at saltwater fly fishing; where do you start? First you need to decide what kind of fish you want to target. Do you want to catch a Calico or White Sea bass out of the kelp beds of California?How about a Striped Bass out of the boiling waters of Boston harbor? A Bone fish in Belize? Maybe a Permit in the Florida Keys. Whatever the decision turns out to be, you have a couple of choices of how to go about it. D.I.Y. Do It Yourself is one way to do it and it’s a blast. Charlotte Harbor area is, are you a licensed and insured guide? Does this make a fly fishing guide able to put you on fish? No, but the United States Coast Guard requires a charter captain to be certified and licensed by them anytime you will be taking money as payment for fishing on any waters governed by the U.S.
To become a charter the USCG also requires that you take and pass an extensive test, have documented experience on the water and pass an FBI and Homeland Security background check. A USCG guide is also required to be a member of a drug consortium in which they can be drug tested at any time. They also must be trained and certified in first aid and life saving techniques. Being a Charter captain is not just “hey buddy, you wanna’ go fish? store clerk…whatever, and will only be on the water when they get a trip or have some time off. They may be very knowledgeable and seem professional, but they may not have taken the time or spent the money to get a license. They also won’t know what the “full timer” knows about what’s happening on the water from day to day. sand holes, and blind cast? Maybe they anchor up and wait on tides to bring you fish? Do they get on the poling platform and push you quietly along mangrove shoreline sight casting to Reds, Snook and Tarpon? Do they get so far into the back country that you get out and wade fish? All of these are good techniques and can be productive. Just make sure the guide can do what you want. I have a couple of clients that come and only want to wade fish. It might not be the best approach at that time, but I’ll get them to places to wade and find fish. 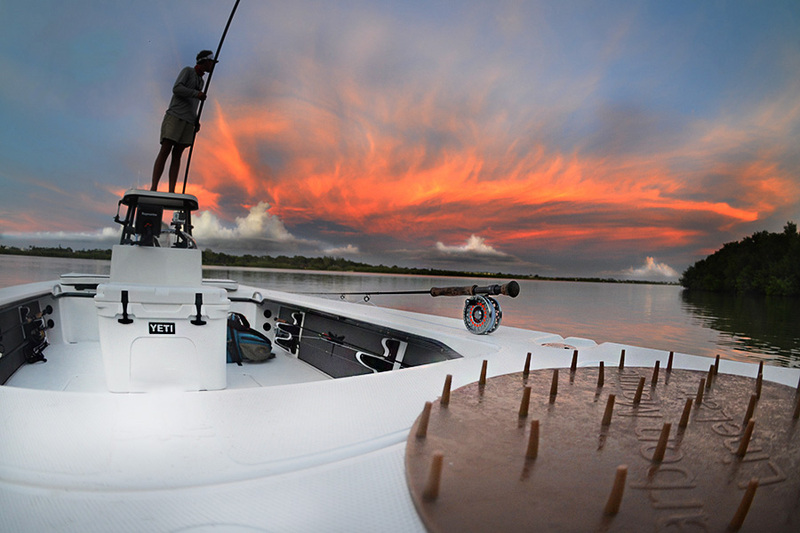 I have clients that only want to sight fish from the bow, so I pole shallow flats and mangrove islands. Then there are clients that don’t care what they do. They just want to catch something. I had a new client on board today. Andy is a spin fisherman who doesn’t fish very often. We used all of these techniques and caught fish using all of them. He had no preference and wanted to learn. By the end of the day he was also thinking about buying a fly rod. Oh yea, I made him try the long rod and he caught a couple of fish. A good fly fishing guide should be able to use all techniques to get his clients on fish.Here, in Charlotte Harbor we are blessed with fantastic back country fishing. We are also blessed with the fact that it doesn’t take long to get outside our barrier islands to the beach in the Gulf of Mexico. Don’t be afraid to ask about nearshore fishing, if that is something you want to do. We just finished with Tarpon season here and the Tarpon have moved into the rivers or have moved on down south to the Glades and beyond. Don’t get me wrong we will be able to catch Tarpon here almost year round, but,the biggest migration of Tarpon in the world has moved on now until next summer. It’s changing into our Fall season. Now the beaches or “nearshore” (staying within a few miles of land or beaches) fishing will be filled with Bonito, Mackerel, King Mackerel, Triple Tail, Jacks, sharks, pompano… etc… Always ask about options. Yes, if you want to catch a Redfish by sight fishing the back country, then, yes stay there all day and work. Just don’t forget the variety of fishing we have here in Charlotte Harbor.If you are relatively new to fly fishing or at least new to fly fishing the salt ask if the guide will instruct and teach while on the boat. There are many guides that will take you out, but are short on patience and only really want experienced anglers on their boat…it hurts their fish percentages to have a newbie on the boat. Ask if they happen to be a certified or better yet a “Master” certified casting instructor with the IFF (International Federation of Fly Fishers). These guys and gals that have gone through the Master Certification want to help you. There is really no other reason to put themselves through the long tough testing process. Sure it’s a feather in their cap. But most of the people who just want the “title” stop at the basic certification level. Most Masters want and do teach. This process isn’t just about being a good caster. It’s a teaching certification. It’s about learning to communicate what makes a cast work for you.But in order to get these “certs” you have to be able to cast very well. The casting skills needed to fish the salt are very different from those used in small trout streams or bass ponds. These folks can and will make you better all-a-round fly fisherman. Ask about the boat in use and the gear that will be provided if you don’t have your own. If you are going to sight fish the back country you don’t want a boat to big to get there. There should be a poling platform and a push pole aboard for the guide to use. There might be a casting platform and stripping basket on the boat if needed. 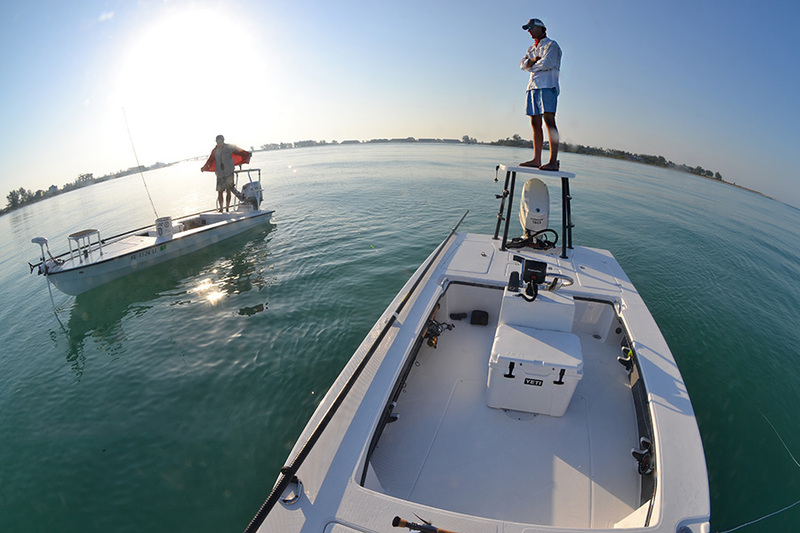 It does not by any means need to be an expensive flats skiff to get you on fish. They are very nice, but not always necessary, for the job. For instance, you probably don’t want to take a 16 or 17 foot flats skiff out of the back country into Gulf the on a breezy day because of swell and chop, so near shore fishing would be out. There is no one boat that can do everything. The rods and reels supplied should be a recognizable brand and relatively new, and of course in the weights needed for the area. Make sure and take your own gear if you want to use it. It’s always better to use what is familiar to you. Tell the guide what you have and they will help you make that decision.There are a few guides who will offer a no fish, no pay policy. Be very careful of this. It sounds good at the time, but there’s always a catch. The way most of these policies are worked is they will have many exemptions or hidden agendas. Meaning that the “”no fish no pay policy for example cannot be used if you are flats fishing, fishing for red fish, kid’s fishing, never saltwater fished before, tarpon fishing and so on. Another way that this is done is the guide will fish for you or fish for non-game fish species of no sport fishing value, like getting bait. Ask your potential guide if he or she offers such a policy and what the exact details are. If you think about it, how can a guide offer something they really have no control over. We all know that sometimes fish just don’t eat! Peruse the fly fishing guide web site. A professional and serious charter captain will most likely have a high quality web site with very useful information on it. The web site will be updated with current information on it as well. It is just a common staple in the day and age we live in now. You may find all of the answers you are wondering about there. Do they practice catch and release? What are they fishing for now? Pictures speak a thousand words. Check out the gallery section. Look at the pictures of the fish they are catching and see the boat they are using. See if the pictures look recent or are they from twenty years ago. There are a lot of You Tube and cyber heroes out there, so even the websites can be misleading pick one, and call him. Make a list of questions you want to ask. The guide should be willing to talk to you and give you all the info you need. When you call, be clear and honest about what it is you are looking for and also what you are not looking for. This is the best way to get a feel for the right guide for you.